Our customer base of house builders, local authorities and construction companies benefit from an expanding array of flat roofing solutions carried out by expert, highly trained operatives. Bituminous roofing has made huge technical advances in performance and quality over the last two decades. The ever-increasing challenges of lighter construction, spanning characteristics of metal decking’s and the introduction of highly advanced thermal insulation saw manufacturers faced with the technical challenge of producing products that could withstand the resultant building movement. The solution was the development of a new generation of technically advanced, “high performance” bituminous products. Many of these bituminous systems, which offer all-round versatility and vastly improved performance – if installed by our trained and approved roofing operatives – will outlast the expected lifespan of the buildings to which they are applied and carry 20+ year insurance-backed warranties. Single ply flat roofing is a fast-growing market offering products developed through modern technology to answer the needs of both new build and refurbishment projects. The ease of application along with its relative low cost make single ply a system of choice for industrial, commercial, domestic and refurbishment sectors. Single ply systems offer solutions that are appropriate for use on flat, pitched, curved and other irregular roofs and are particularly suitable for contracts where environmental considerations are primary requirements of the design. Our single ply systems can accommodate most roof areas including roof gardens, green roofs and other areas that are subject to regular access (foot traffic) to meet the specification requirements of any client. The performance of most specified single ply systems is backed by substantial guarantees, which can be tailored to suit client needs. Our expert roofing operatives are able to specify and are approved contractors for the installation of many cold-applied systems, including liquid coatings such as liquid plastics and GRP. The main advantages of these systems are their flexibility and ability to be used for roof refurbishment or repair, saving the cost of stripping off the existing failed or degraded roof. Our roofers sometimes work for clients on projects where the use of a naked flame or a bitumen pot on site is prohibited. Key benefits of the liquid systems include their ability to offer a quick and easy solution to roofing repairs which can be applied in most weather conditions without the need for the application of heat, which eliminates fire risks. The versatile properties of Liquid coatings make them especially effective in answering the challenges of difficult areas. 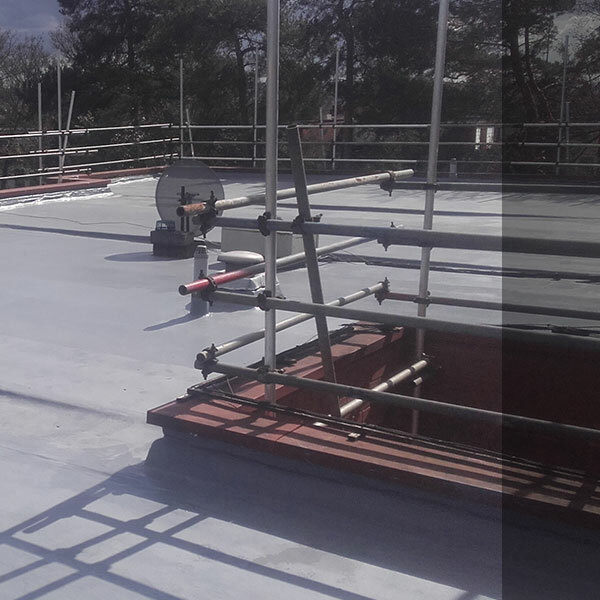 Our skilled flat roofing operatives can deploy the coatings to cover the most intricate of roof areas, regardless of any awkward detailing or where the presence of existing plant and air conditioning units may prevent clear access. We are committed to the environment and this has led to the introduction of a series of ‘green’ roof solutions. Bringing these exciting innovations to market has been achieved by strategic partnering with specialist green roof suppliers. This reflects our positioning at the forefront of technologies and material selection to meet the growing demand for low carbon housing developments across the UK. Green roof options include flat or pitched solutions installed as either high or low maintenance as dictated by the specification and design.